One of the biggest steps to improving your skill level is understanding bidding systems. 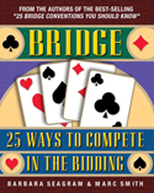 Strategic bridge conventions can significantly impact your partnership's bidding during the auction. 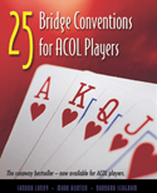 This book lays out 25 of the more common Bridge Conventions for ACOL players, (a common bidding system common in the United Kingdom but rarely played in the United States). 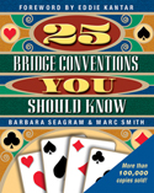 A similar book - 25 Bridge Conventions You Should Know - is one of the best selling books in the past 50 years but is geared toward bidding systems more commonly played in the United States. This book provides a great resource for the novice player to learn how to assimilate common conventions into the ACOL system while keeping the bidding as natural as possible. Choosing which conventions your partnership should try is easy as each one is clearly explained. The lessons include a summary of the main aspects of each convention and quizzes that help you understand how to bid using that convention. 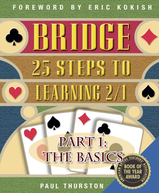 World champion Sandra Landy teams up with a bridge magazine editor Mark Horton and bridge instructor Barbara Seagram to create a great resource for beginning bridge players. 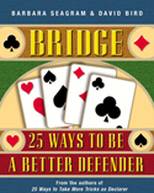 Beginning and Intermediate bridge players are inundated with conventions. Which ones should you learn? 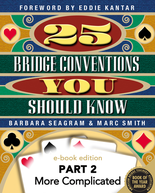 Marc Smith and Barbra Seagram discuss 25 basic conventions and treatments that you should know. They are explained in sufficient, but not overwhelming detail. The reader is also provided with a summary of each section or convention and many opportunities to quiz themselves. 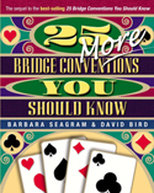 From the best-selling book 25 Bridge Conventions You Should Know, 'Part 1: Learn these first' includes the following conventions: Chapter 1: Stayman 2C response to 1NT Chapter 2: Takeout doubles Chapter 3: Weak two-bids Chapter 4: 2C strong artificial opening Chapter 5: Reverses Chapter 6: Blackwood and Gerber Chapter 7: Negative doubles Chapter 8: Jacoby and Texas transfers For the remaining conventions, look for these titles: 25 Bridge Conventions You Should Know - Part 2: More Complicated 25 Bridge Conventions You Should Know - Part 3: Sophisticated Stuff"
25 Conventions: More Complicated,"Barbara Seagram,Marc Smith",978-1-55494-172-8 ,6.99,Done,ALL,ebook%202%2025Conv_s_LRG.jpg,"Based on the best-selling book 25 Bridge Conventions You Should Know, 'part 2: More Complicated' includes the following conventions: Chapter 9: Jacoby 2NT forcing major raise Chapter 10: Splinter bids Chapter 11: Cuebid raises Chapter 12: Balancing Chapter 13: Help suit game tries Chapter 14: Control-showing cuebids Chapter 15: Grand slam force Chapter 16: Michaels cuebids and Unusual NT Chapter 17: Landy 2C over opponents' 1NT For the remaining conventions, look for these titles: 25 Bridge Conventions You Should Know - Part 1: Learn These First 25 Bridge Conventions You Should Know - Part 3: Sophisticated Stuff"
Are you ready to switch over to today's most popular new bidding method? If you know how to bid using Standard American,you can make the move to the modern Two-over-One system using the 25 easy Steps contained in this book. 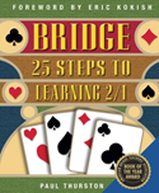 Among the topics covered are: Bridge: 25 Steps to Learning 2/1 Part 2: More Advanced Step 13 In a Minor Key Step 14 Notrump Responses to Minors Step 15 Raising Partner's Minor Step 16 Rebids Over Minor-Suit Openings Step 17 After Notrump Responses to Minors Step 18 After a Minor Suit is Raised Step 19 Fourth Suit Forcing (FSF) Step 20 Weak Jump Shifts Step 21 New Minor Forcing Step 22 Ingberman Over Reverses Step 23 Over a Takeout Double Step 24 The Opponents Overcall Step 25 Is That All There Is?" A follow-up book from the author team that produced the award-winning and best-selling 25 Bridge Conventions You Should Know. Aimed at the same novice/social/intermediate player as their first book in the award-winning '25' series, this new title deals with competitive auctions in which the opponents have opened the bidding. 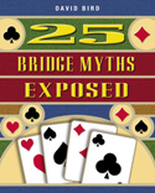 This is the most complex area of bridge bidding, and never, until now, has it been dealt with comprehensively in a book that is understandable by non-experts. Take more tricks whenever you play the hand! Isn't that what being a good declarer is all about? However good or bad partner's bidding may be, once the dummy comes down, it's up to you, the declarer, to make the best of it. And in this book, in 25 easy steps, you'll learn how. Join master bridge teachers Barbara Seagram and David Bird as they first show you the basic building blocks: finesses, hold-up plays, establishing a suit, making extra tricks with ruffs, and setting up discards. 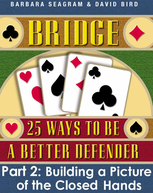 Then move on to learning how to make a plan at the start of each hand, how to count the opponents' hands and then use that information, and how to keep a dangerous opponent from getting the lead. Finally you'll be ready for more advanced techniques that you may think are beyond you: safety plays, dummy reversals, eliminations and throw-ins. Loaded with good, easy-to-understand advice, along with chapter-end quizzes, key-point summaries and a glossary of technical bridge terms, this book is sure to help you become a better declarer, and a popular partner.